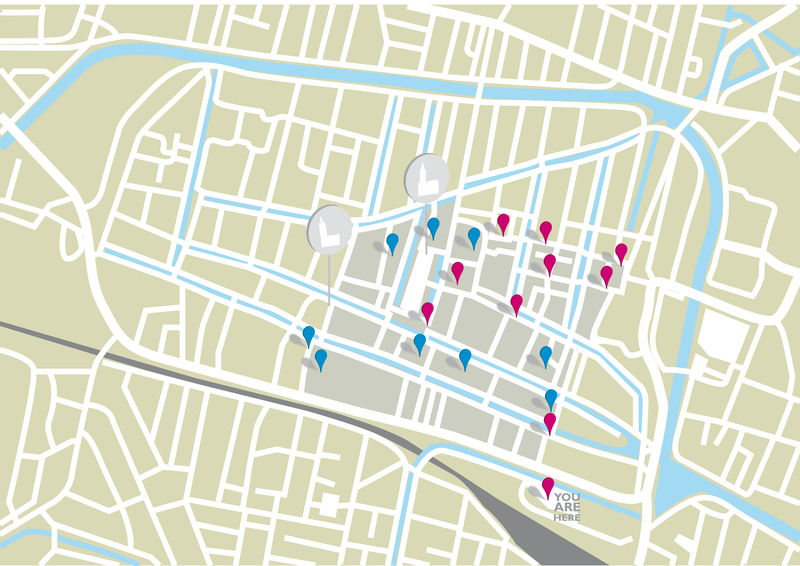 We are Visual Tracks, a group of four students from the faculty Industrial Design Engineering at the TU Delft. 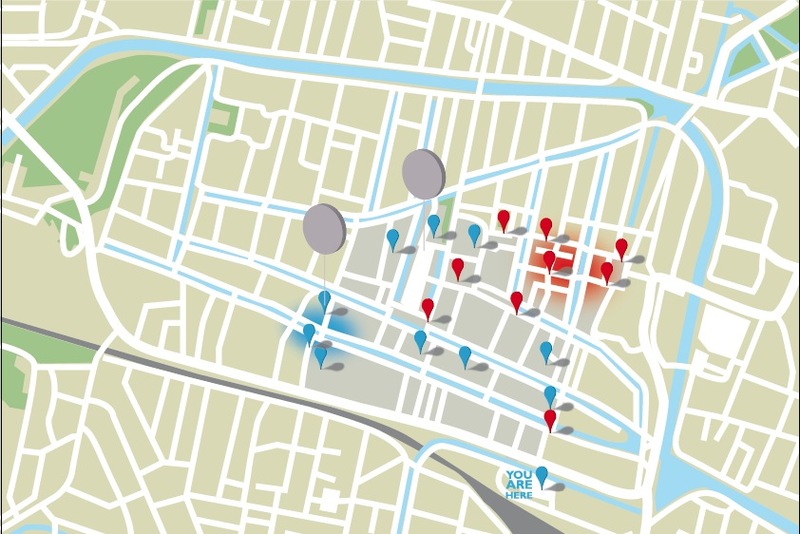 For the course Visual Communication Design, we were assigned to develop a pedestrian map concept of the centre of Delft that manipulates the map viewer to choose a certain walking route over another. Both routes start and end at Delft central station and is aimed at tourists who come to Delft for shopping and museum/cultural purposes. 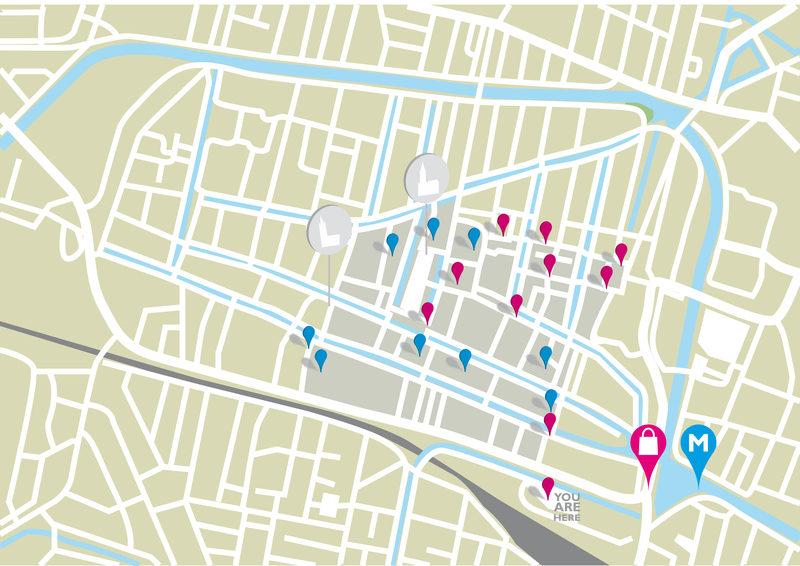 Visitors may follow the route in either direction: Clockwise, the ‘Museum route’, or anticlockwise, the ‘Shopping route’. As the name implies, the museum route starts with visiting the cultural heritage of Delft and the shopping route takes the visitor to the shopping areas of Delft. This is visualized in the figure below. The process from concept development to the final design can be found in this report. The maps should be simplistic in terms of design language but also in terms of the amount of information displayed to the map viewer. The map is to be viewed only at the beginning of the route, when the users are at the central station in Delft. When overloaded with information, nothing will really be memorized by the users. Only the necessary and important information should therefore be displayed. Extensive descriptions or visualizations of all the museums and/or shopping fascilities should be avoided, because of the mentioned reasons. Furthermore, this way, the chances for making route choices based on personal preferences (for instance a strong dislike of oil paintings) are minimized. 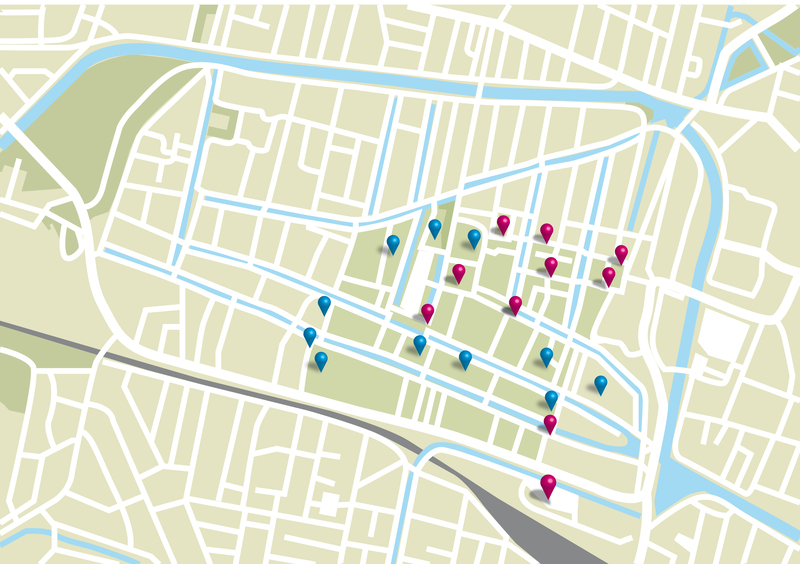 Besides being able to manipulate the map viewer to choose a certain walking route over another, the maps should be aesthetically appealing as well. 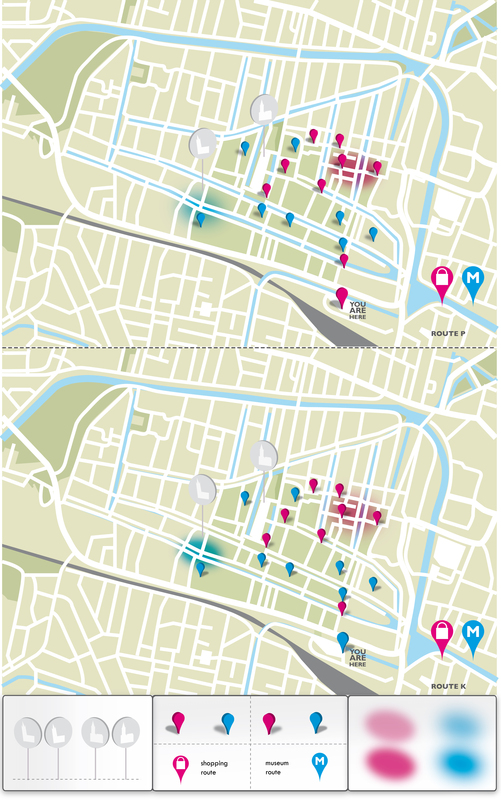 An interesting challenge lies in making the difference between the two maps for shopping route and museum route so subtle that they are hardly noticeable, yet effective enough to influence the choice of walking route. We want to explore how far we can go in the subtleness of the design without loosing the effect. The theory presented in Colin Ware’s book ‘Visual Thinking for Design’ will be used as a guideline. For the concept development, a design of the map background was made first. 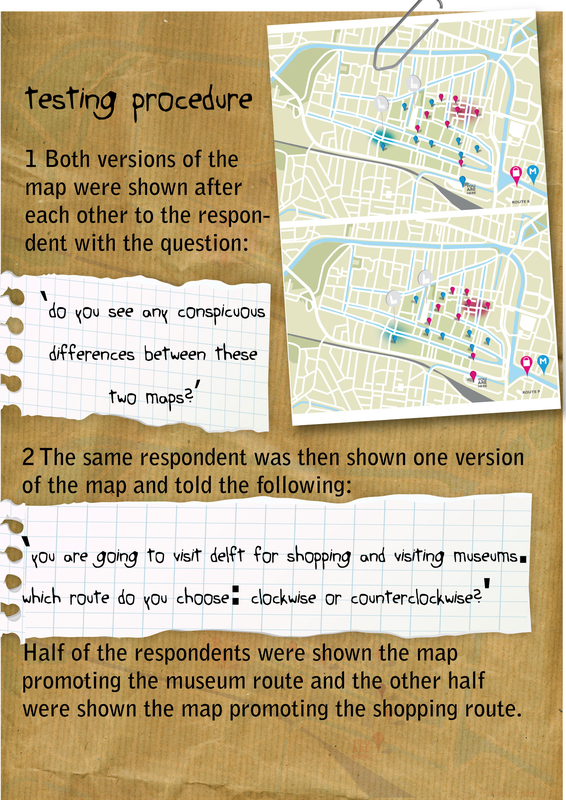 This was based on data from an existing city map. All information besides the streets and canals were removed. 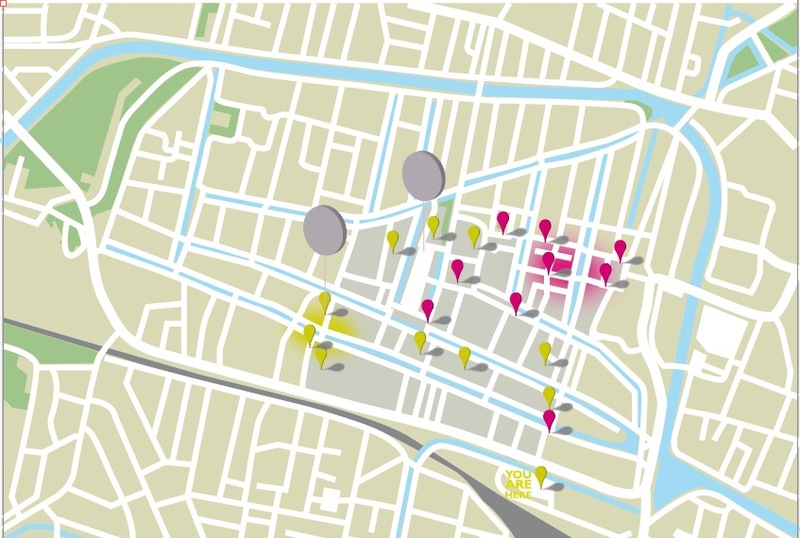 CityMurmur tries to understand and visualize how media attention reshapes the urban space and city. 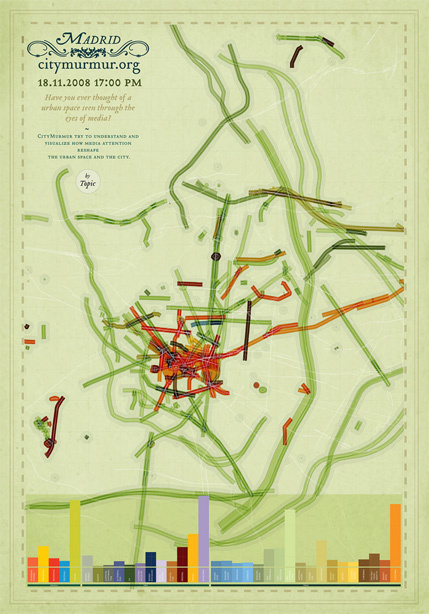 A graphical visualization of the neighbourhoods of Chicago by Ork. 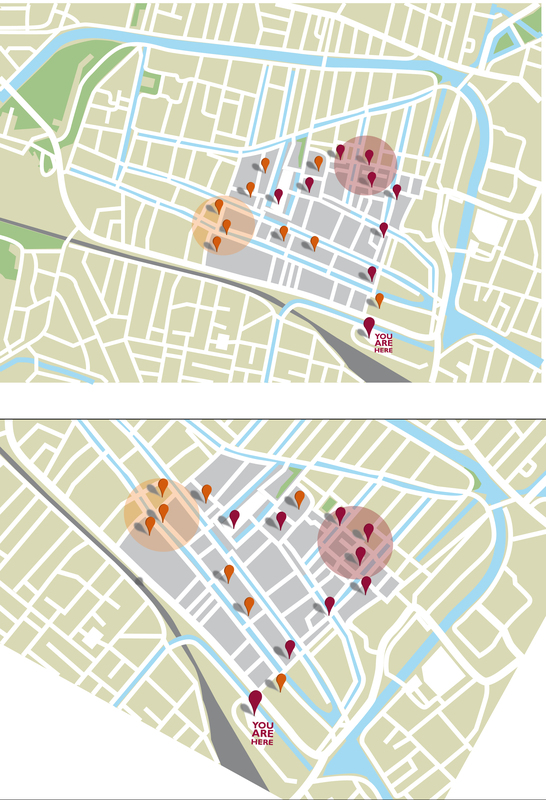 After a group session, two types of path displays for the map background were developed, resulting in a concept A and a concept B. 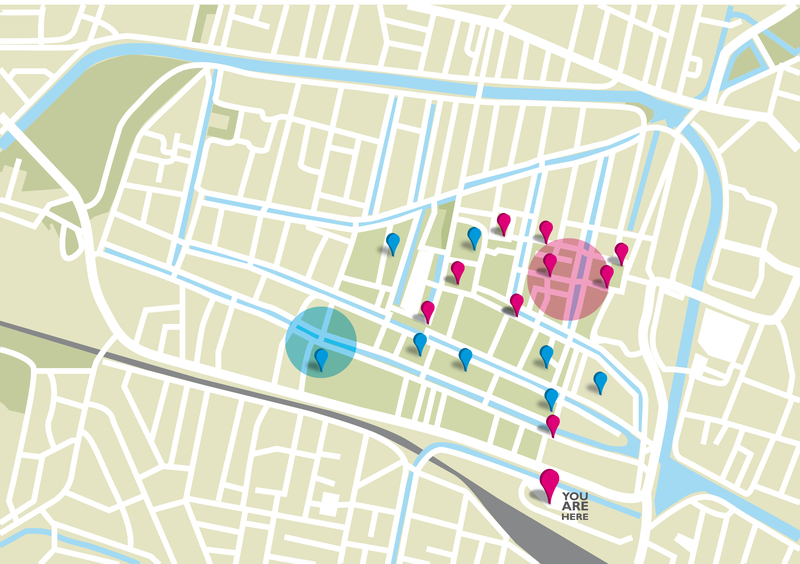 Common for both concepts is the simplistic use of abstract symbols like circles or pointers instead of showing the actual activity one can undertake at a certain area on the map. The parameters for both concepts are visually explained below. Orientation figure: The You-are-here figure in concept A is made larger than the other figures to pop-out. The figure is also most likely the first thing the user will be looking for. 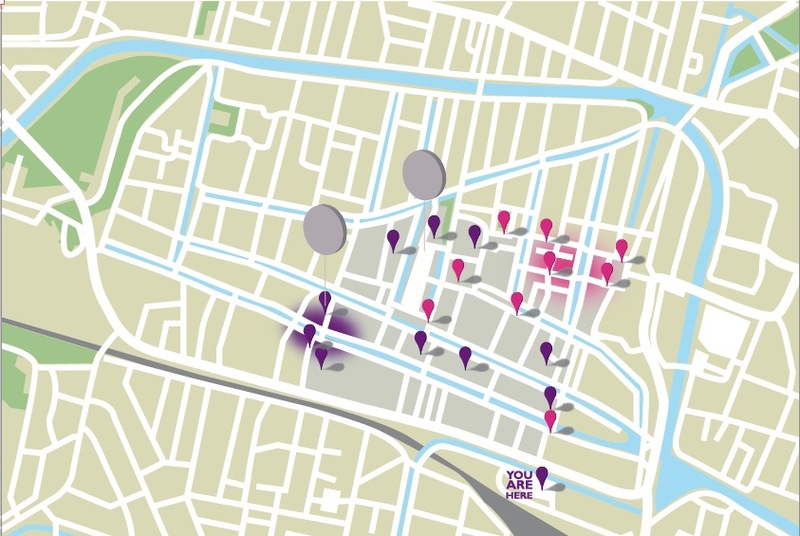 It has the same colour as the figures showing shopping possibilities for the shopping route and vice versa for the museum route. 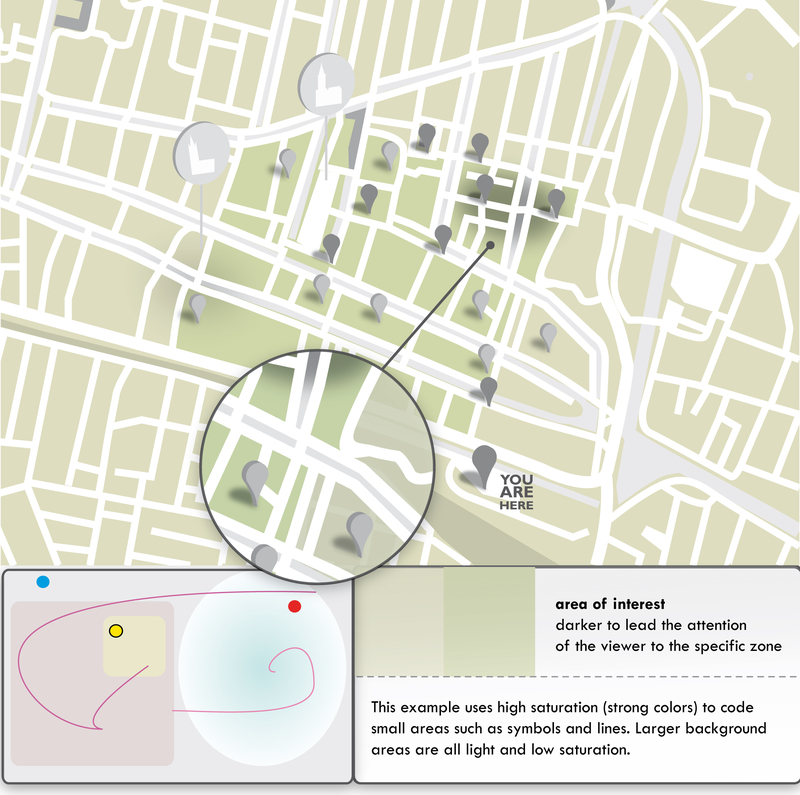 When having noticed the colour of the You-are-here-figure, brain neurons will be “triggered” to look for similar colours when choosing the route to follow. 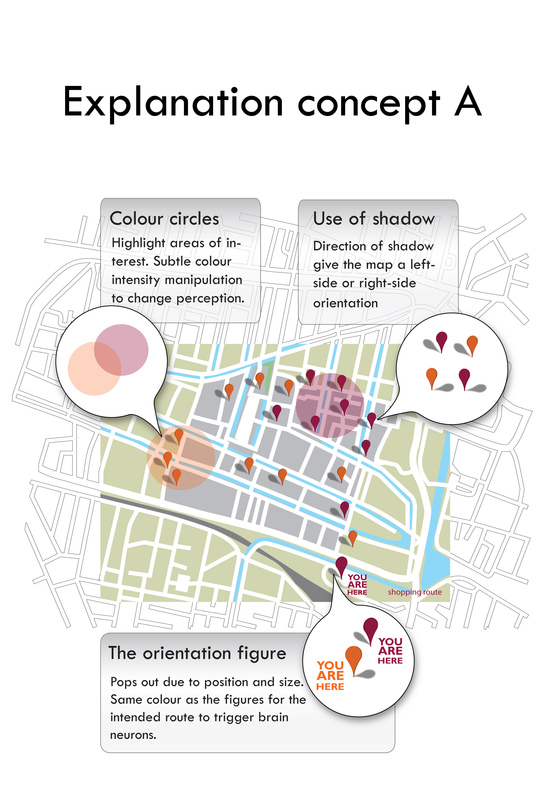 Different direction of shadows: For concept A, the shadows for the different figures point to the upper left for the shopping route and upper right for the museum route. This is done to manipulate the eye movements, as the eyes will perceive the right side of the figures as the front for the shopping route map, making the map more right-side oriented. 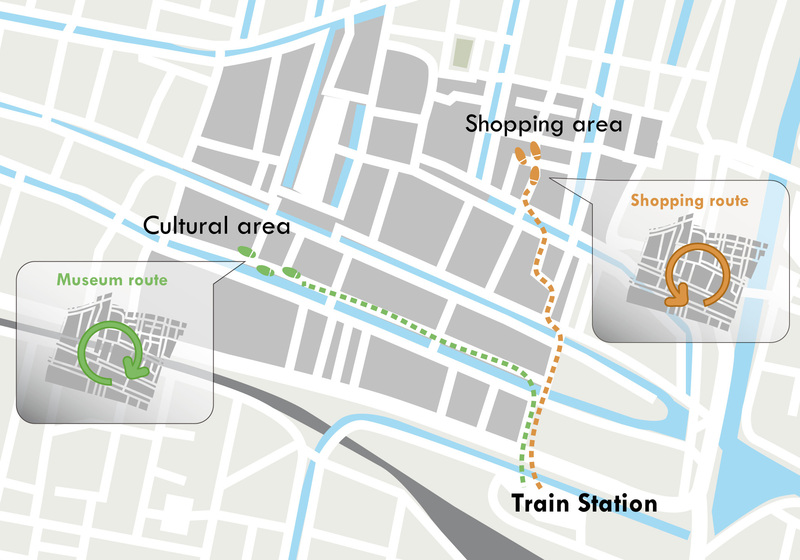 As the shopping route is on the right side of the map, this will have a positive influence on choosing the shopping route over the museum route. 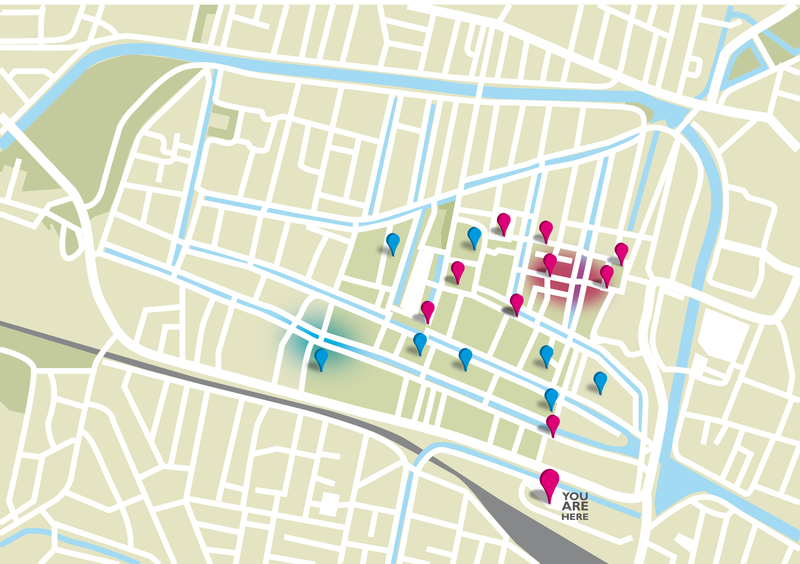 The opposite is done for the museum route map, where the front of the figures seem to be at the left side, making the map more left-side oriented and thereby leading the eyes to the museum route at the left side of the map. Density circles are also in concept B, and also here is the transparency of the circles manipulated. However, here is also the size of the circles used as a means to highlight certain areas and manipulate the eye movements. The eye will automatically be drawn to the areas with the biggest circles. Walking path: In concept B, the walking path is used to manipulate the eye movement. The eyes will be drawn to the path and to the areas of the path that have the highest thickness (and area of interest). Based on feedback given during the concept presentation, we decided to go further with concept A. 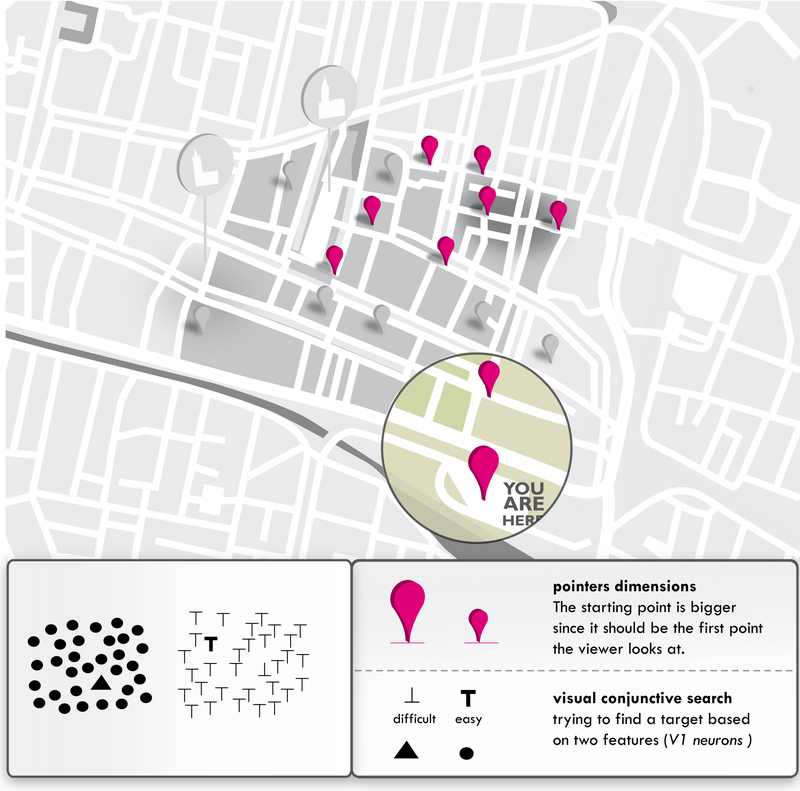 Concept A uses pointers and the dark city centre area to show the walking route instead of a route line. This is an interesting aspect which we wanted to explore further, as most map concepts of the other groups were using a fixed route line. 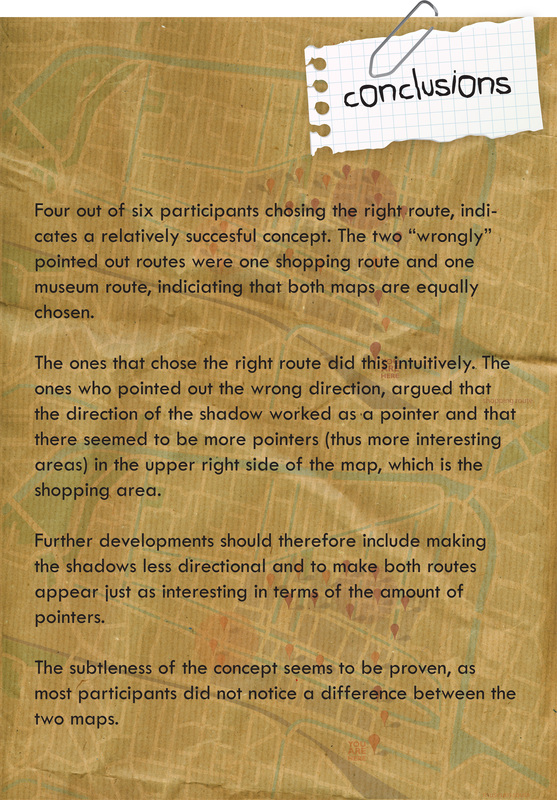 Furthermore, the shadows of the pointers offered great opportunities for implementing subtle differences in the map design. 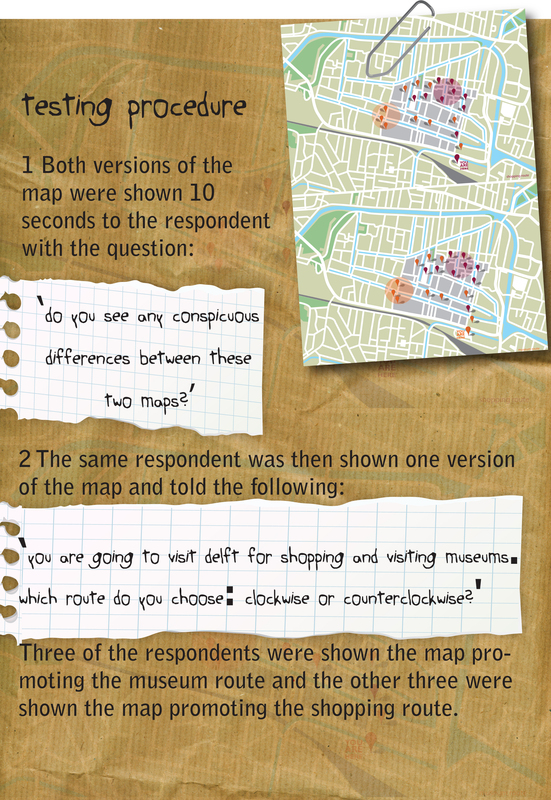 The question remained if it would still be clear which route to follow for users without having a route line in the map. We were also curious about the effect of the pointer shadows and the density areas. A first user test with concept A was therefore performed. The test was executed with six persons who were not acquainted with Delft. The test procedure and a description of the participants can be found below. 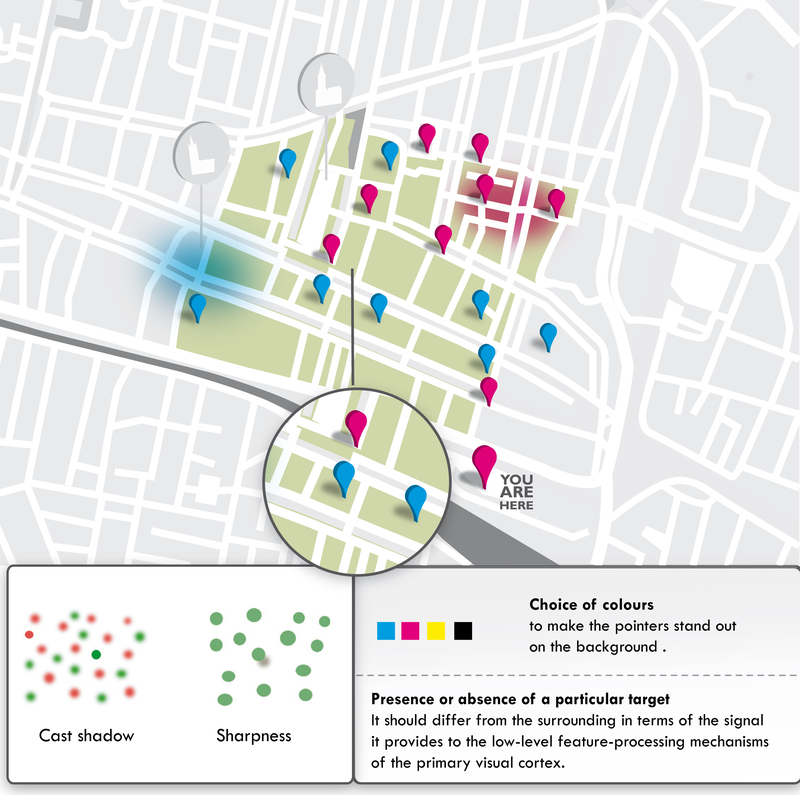 As a next step towards the final map design, the visual parameters on which the map is based were considered separately. This way, tunnel vision was avoided and all aspects of the map could be investigated. The street names were removed from the map, because it was considered more effective having clear reference points, such as the two churches, which area landmark easier to remember than street names. The symbols of the churches were modified from simplistic black and white sketches to balloons with even more linear symbols. The balloons were placed on a higher level, in order to prevent the church symbols to interfere with the pointers. The first draft of the symbols was a kind of representation of two scenarios: the shopping and the historical path. 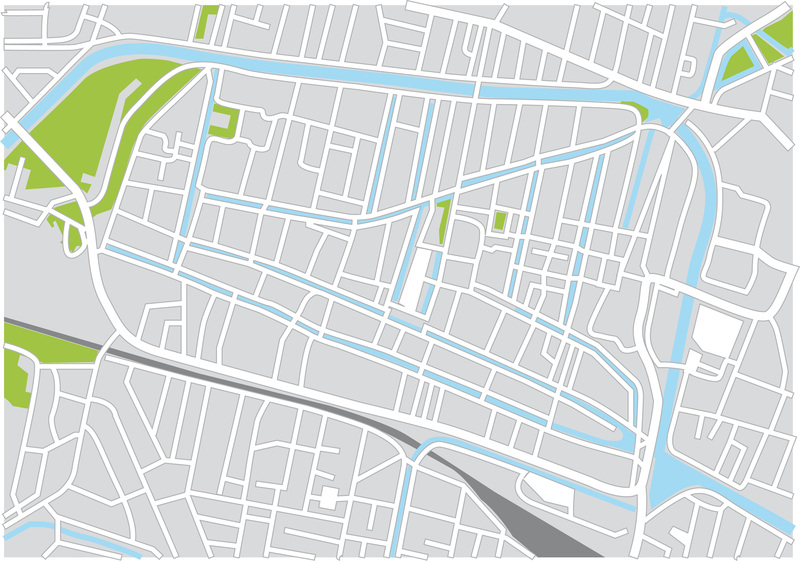 The second proposal was aimed to fit more the simple style of the rest of the map and to use symbols that are already in the visual background of people. The symbols are visible outside the map. The viewer is supposed to link the symbol to the colour. 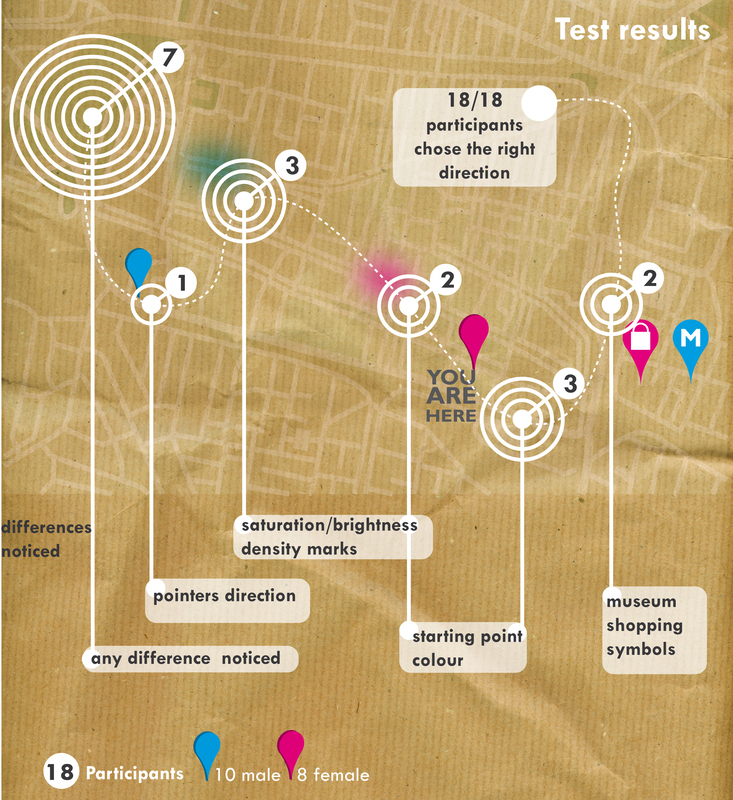 This trick was used for two reasons: the pointers can be smaller and more visible without the redundancy of the symbols repeated, and the choice of the route can be based only on visual parameters without the influence of personal preferences towards the shopping or the museum route. After different trials, it was decided to use the CMYK code for the pointers and secondary, dimmed colours for the rest to create more contrast and let the pointers stand out. The drop-shaped pointers were modified and another 3d shape was tried out. The shadows were differentiated: the pointers on the preferred route have a more sharp edge, while the others have a bigger gaussian blur radius. 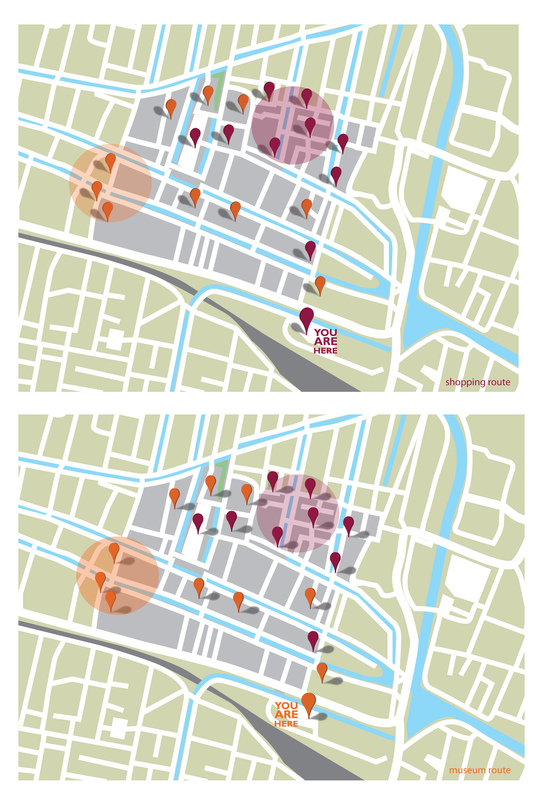 The two areas with high density of attractions, one for each route, were tried out in different ways. The transparent circles were considered too overwhelming and static, as well as the faded circles in perspective on top of the drawing. Therefore a more successful trial was made with the areas under the network of the streets. Also to the blur of the area, a different radius of Gaussian blur was applied to make one area more visible at first sight than the other. 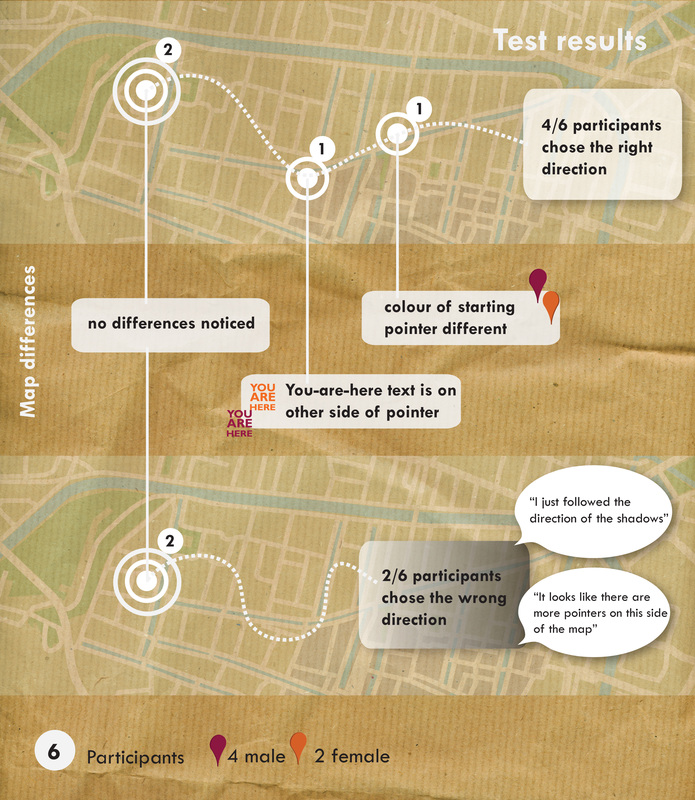 Some experiments were made with changing the map orientation. By moving the viewing orientation to the middle of the angle between the two routes, both routes would seem even far away. However, this was disgarded because of positive results from user testing with the previous orientation and because of the usability aspect: it was considered more important to make the angle of the map match the viewing angle of the viewer at the starting point of the station. 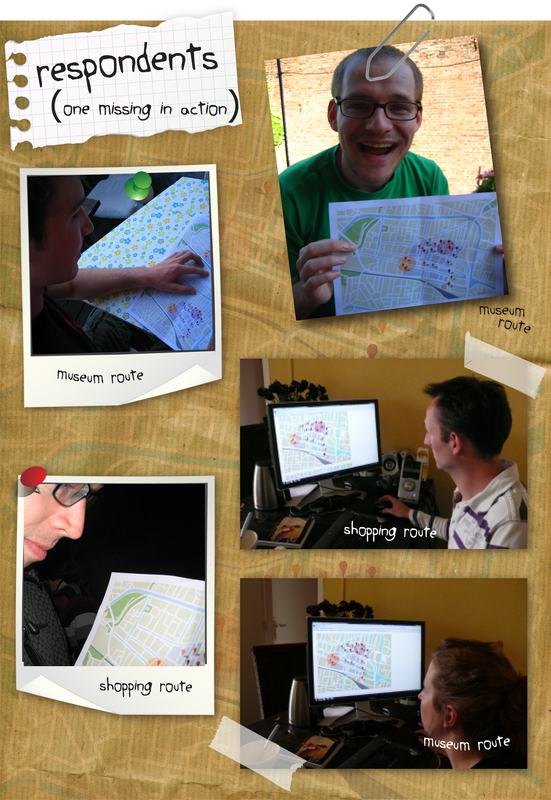 Combining the best outcomes for all the parameters in the end, resulted in the final map design. 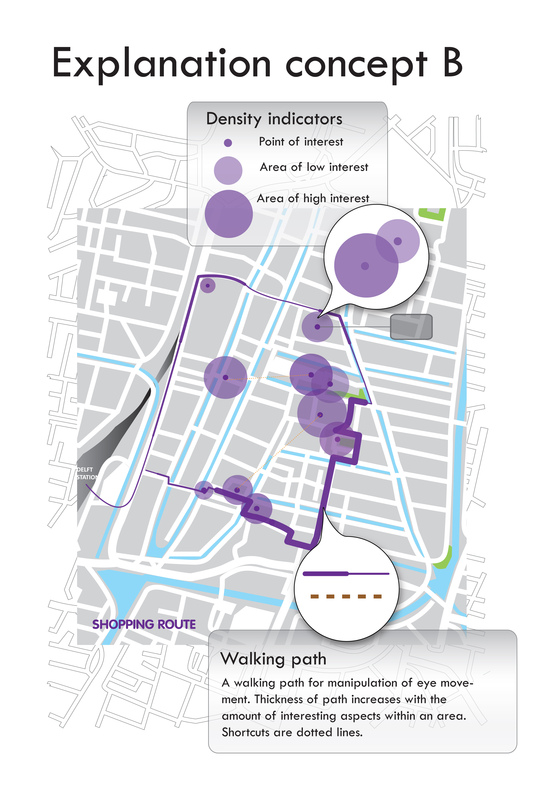 The six main visual parameters used are visually presented under the map for route K and route P.
A second user test was performed to test the effectiveness and subtleness of the final design. The test was conducted with 18 participants on the street in Amsterdam.